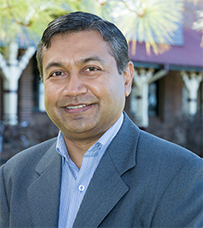 A/Prof Farooque joined University of New England in August 2007. Before joining UNE he served the University of Auckland for more than 2 years from February 2005 to April 2007. He also worked part-time at the Victoria University of Wellington during his PhD study from 2001 to 2004. Previously, he had held academic appointments up to Associate Professor at the University of Dhaka during 1992 to 2004. A/Prof Farooque has wide experience of teaching accounting, finance and banking. His current teaching area is Financial Accounting, Accounting Project and Auditing. He is active in corporate governance, executive compensation, auditing, financial reporting/disclosure, earnings management, CSR, finance and banking research. A/Prof Farooque has wide experience in accounting, finance and banking research and published widely in international journals. His research profile reflects multi-disciplinary breadth in conducting empirical research in business. His principal research areas are Corporate Governance, Board Diversity, Executive Compensation, Financial Reporting and IFRS, Earnings Management/quality, Disclosure Quality, Auditing, CSR and Sustainability Reporting, FDI, SME, Corporate Finance, Dividend Policy, Cost of Equity, Insider Trading, Real Estate, Capital Market Investment, Banking (including Islamic Banking), and Business Ethics. “Direct engagement with New England and North West Aboriginal communities to increase enrolments in Law and Business Courses”. University of New England (UNE) HEPP funding, 2016. “Audit Committee and Fraud: The Moderating Effects of Female Director”. Jointly with Nooraisah Katmun, Mohammad Abdullah Jusoh, Hartini Jaafar, Hazianti Abdul Halim. Universiti Pendidikan Sultan Idris (UPSI), Malaysia, 2016/2017. “Fair Value Accounting and Market Volatility in Australia”. Jointly with Lan Sun. AFAANZ Research Grants, 2015/2016. “Exploring Ethical Sensitivity and Mindset of Accounting Graduates: Emerging Trends from a Regional University in Australia”. AFAANZ Research Grants, 2014/2015. “Financial Impact of Natural Disasters: A Comparative Study of Selective Countries”. Jointly with Professor Brian Gibson, Professor Peter Eddey, Mohammed Hossain and Kazi Islam. TOP Education Institute, Sydney, March 2014. “Sustainable Financial Reporting Practice in Australian Companies - Does Quality Matter”? 2014 UNE Research Seed Grants. Duration – 12 months (January 2014 – March 2015). “Identifying Causes of Organizational Failure in Australian Listed Firms”. Jointly with Marcus Rodrigs (University of Newcastle). Centre for Institutional and Organisational Studies, University of Newcastle’ research fund, November 2012. Duration – 6 months (January – June 2013). “A study on the State of the Art in Target Costing Management of the Manufacturing firms in Thailand”. Jointly with Nimnual Visedsun, Kanitsorn Terdpaopong (Rangsit University, Thailand), and Prof. Wee ShuHui (Universiti Teknologi MARA, Malaysia), Rangsit Research Institution, Rangsit University, Thailand. Duration – 1 year (July 2012-June 2013). Farooque, O. A. (2010). Corporate Governance: An Emerging Market Context – Lessons for Regulators, Policy Makers and Stakeholders. ISBN: 9783838397580. Chatterjee, B., M. Z. Mir & O. A. Farooque (2009). The Current Status of Related Party Disclosure in India: A Longitudinal Analysis. Prof. Mathew Tsamenyi and Dr Shahzad Udding Edited Book 'Accounting in Emerging Economies', Series: 'Research in Accounting in Emerging Economies', 9(9), 287-319, 19 November 2009, (ISSN: 1479-3563; ISBN: 9781849506250); Emerald Group Publishing Limited. Hossain, M. and Farooque, O. A. (2018). “The Emission Trading System, Risk Management Committee and Voluntary Corporate Response to Climate Change - A CDP Study”. Accepted for publication in the International Journal of Accounting and Information Management. [ABDC journal ranking – B]. Suyono, E. and Farooque, O. A. (2018). “Do Governance Mechanisms Deter Earnings Management and Promote CSR? Insights from Indonesia”. Accounting Research Journal, Vol. 31 (3), pp. 479-495. DOI: 10.1108/ARJ-09-2015-0117. [ABDC journal ranking - B]. Chowdhury. A., Mollah, S. and Farooque, O. A. (2017).“Insider Trading, Discretionary Accrual and Information Asymmetry”. TheBritish Accounting Review, DOI: 10.1016/ j.bar.2017.08.005. Katmon, N., Mohamad, Z. Z., Norwani, N. M. and Farooque, O. A. (2017). “Comprehensive Board Diversity and Quality of Corporate Social Responsibility Disclosure: Evidence from an Emerging Market”. Journal of Business Ethics, DOI: 10.1007/s10551-017-3672-6. Fonseka,M. M., Farooque, O. A., Rajapakse, R. L. T. N.and Tian,G-L. (2017). “Political and interlocking connections in the boardroom on private equity placements”. Emerging Markets Finance and Trade, DOI: 10.1080/1540496X.2017.1355300. Hossain, M., Farooque, O. A., Momin, M. and Obaed, A. (2017). “Women in the Boardroom and Their Impact on Climate Change Related Disclosure”. Accepted in the Social Responsibility Journal, DOI: 10.1108/SRJ-11-2016-0208. Sun, L. and Farooque, O. A. (2017). “An Exploratory Analysis of Earnings Management Practices in Australia and New Zealand”. International Journal of Accounting and Information Management. Vol. 26 (1), DOI: 10.1108/IJAIM-09-2016-0087. Mollah, S., Hassan, M. K., Farooque, O. A. and Mobarek, A. (2017). “The Governance, Risk-taking, and Performance of Islamic Banks”. Journal of Financial Services Research, Vol. 51 (2), pp. 195-219, DOI: 10.1007/s10693-016-0245-2. Katmon, N. and Farooque, O. A. (2017). “Exploring the Role of Internal Corporate Governance on the Relation Between Disclosure Quality and Earnings Management in the UK Listed Companies”. Journal of Business Ethics, Vol. 142(2), pp. 345-367, DOI: 10.1007/s10551-015-2752-8. Farooque, O. A. and Ahulu, H. (2017). “Determinants of Social and Economic Reportings: Evidence from Australia, UK and South African Multinational Enterprises”. International Journal of Accounting & Information Management, Vol. 25 (2), pp. 177-200, DOI: 10.1108/IJAIM-01-2016-0003. Farooque, O. A. (2016). “Sustainable Financial Reporting Practice in Australian Companies - Does Quality Matter”?Journal of Developing Areas (Special Issue), Vol. 50 (6), pp. 175-189, DOI: 10.1353/jda.2016.0138. Agarwal, N. and Farooque, O. A. (2016). “How to Outperform Emerging market Indexes using passive Indexation?” Briefings in Entrepreneurial Finance, Vol. 25 (5), pp. 501-508. Agarwal, N. and Farooque, O. A. (2016). “Alternate Equity Indexation for Technology Stocks: An Application to the NASDAQ index”. Economics, Management, and Financial Markets, Vol. 11(1), pp. 41-51. Farooque, O. A. and Ahulu, H. (2015). “Environmental Reporting in the UK, Australia and South African Multinational Companies”. Journal of Developing Areas (special issue), Vol. 49 (6), pp. 103-118, DOI: 10.1353/jda.2015.0117. Agarwal, N. and Farooque, O. A. (2015). “Alternative Equity Indexation Method”. Corporate Finance Review, Vol. 20(2), pp. 14-21. Accounting, Vol. 8 (3), pp. 137-156. Arouri. H., M. B. Muttakin, M. Hossain and O. A. Farooque (2014). "On the Relation between Internal Corporate Governance and Bank Risk-taking: Evidence from Gulf Cooperative Council Countries". Academy of Taiwan Business Management Review, Vol. 10 (1), pp. 91-100. Farooque, O. A., S. Eko and R. Uke (2014). "Link between Market Return, Governance and Earnings Management: An Emerging Market Perspective". Corporate Ownership and Control, Vol. 11 (2), PP. 192-211. Ahulu, H., Farooque, O. A. and Kotey, B. (2014). "Are Social Issues Relegated to the Backburner? An Analysis of CSR Reports of Australian MNES. Journal of Accounting, Ethics and Public Policy, Vol. 15(1), in press. Farooque, O. A. and S. R. Yarram (2013). "Evidence on Two-way Relationships between Foreign Direct Investment Inflows and Country-level Individual Governance Indicators". The Singapore Economic Review, Vol. 58(2), pp. 1350013-1 to 1350013-26. Mollah, S., Farooque, O. A. and Karim, W. (2012). "Ownership Structure, Corporate Governance and Firm Performance: Evidence from an African Emerging Market". Studies in Economics and Finance, Vol. 29(4) pp. 301 – 319. Sun, L. and Farooque, O. A. (2012). "Industry Evidence on Earnings Management - A Comparative Analysis of Accounting Models". Academy of Taiwan Business Management Review, Vol. 8(2), pp. 120-130. Bayerlein, L. and Farooque, O. A. (2012). "Influence of a Mandatory IFRS Adoption on Accounting Practice: Evidence from Australia, Hong Kong and the United Kingdom". Asian Review of Accounting, Vol. 20(2), pp. 93-118. Terdpaopong, K. and Farooque, O. A. (2012). "Financial Distress, Restructuring and Turnaround: Evidence from Thai SMEs". Rangsit Journal of Arts and Sciences, Vol. 2(2), pp. 119-132. Farooque, O. A. (2010). An Examination of the Determinants of Corporate Ownership Structure in an Emerging Market Context. Malaysian Accounting Review, 9(1), 105-122. Farooque, O. A., van Zijl, T., Dunstan, K. & Karim, AKM W. (2010). "Co-deterministic Relationship between Ownership Concentration and Corporate Value: Evidence from an Emerging Market". Accounting Research Journal, Vol. 23(2), pp. 172-189. Chatterjee, B., Mirshekary, S. & Farooque, O. A. (2010). Users' Information Requirements and Narrative Reporting Relationship between: The case of Iranian Companies. Australasian Accounting Business and Finance Journal, 4(2), 79-96. Farooque, O. A. & Yarram, S. R. (2010). Corporate Governance and Foreign Direct Investment Inflows: Cross-sectional International Evidence. American Journal of Finance and Accounting, 2(1), 1-15. Farooque, O. A., van Zijl, T., Dunstan, K. & Karim, AKM W. (2007). Corporate Governance in Bangladesh: Link between Board Ownership and Financial Perforance. Corporate Governance: An International Review, 15 (6), 1453-1468. Farooque, O. A., van Zijl, T., Dunstan, K. & Karim, AKM W. (2007). Ownership Structure and Corporate Performance: Evidence from Bangladesh. Asia-Pacific Journal of Accounting & Economics (APJAE), 14(2), 127-150. Suyono, E., Farooque, O. A. and Riswan (2016). “Toward a Model of Traditional Retailers and Sellers Empowerment in Improving Competitiveness against Modern Markets in Banyumas Region, Indonesia”. Business & Economics Review, Vol. 25(1), pp. 1-18, (DLSU journal, Philippines). [High index in Scopus and high rank in Scimago journal and country ranking]. Terdpaopong, K. and Farooque, O. A. (2015). “Exploring Succession Planning of Thai Family-Owned SMEs”. Journal of Business Administration (Thammasart Business Journal, Thailand), Vol. 38, No. 147, pp. 68- 93, DOI: 10.14456/jba.2015.14. [First rank Thai Citation Index (TCI)]. Arouri. H., Muttakin, M. B., Hossain, M. and Farooque, O. A. (2014). “On the Relation between Internal Corporate Governance and Bank Risk-taking: Evidence from Gulf Cooperative Council Countries”. Academy of Taiwan Business Management Review, Vol. 10 (1), pp. 91-100. Farooque, O. A., Eko, S. and Uke, R. (2014). “Link between Market Return, Governance and Earnings Management: An Emerging Market Perspective”. Corporate Ownership and Control, Vol. 11 (2), pp. 192-211. Sun, L. and Farooque, O. A. (2012). “Industry Evidence on Earnings Management - A Comparative Analysis of Accounting Models”. Academy of Taiwan Business Management Review, Vol. 8(2), pp. 120-130. Terdpaopong, K. and Farooque, O. A. (2012). “Financial Distress, Restructuring and Turnaround: Evidence from Thai SMEs”. Rangsit Journal of Arts and Sciences, Vol. 2(2), pp. 119-132. Farooque, O. A., T. van Zijl, K. Dunstan and AKM W. Karim (2005). A Simultaneous Equations Approach to Analysing the Relation between Ownership Structure and Performance in Bangladesh. Working Paper No. 35, Centre for Accounting, Governance and Taxation Research, Victoria University of Wellington, New Zealand. Farooque, O. A. and Ahmed, K. (2019). “Future Earnings Predictability and Corporate Governance: Australian Evidence”. Journal of Contemporary Accounting and Economics Annual Symposium, January 2019, Putrajaya, Malaysia. Alghamdi, A. K., Donleavy, G., Farooque, O. A., Khan, A. and Anderson, J. (2018). “Theories linking Capital Structure with Financial Performance”. Melbourne International Business and Social Science Research Conference, October 2018, Melbourne, Australia. Mohd Kharuddin, K. A., Basioudis, I. G. and Farooque, O. A. (2018). “Effects of the Big 4 National and City-Level Industry Expertise on Earnings Management in the UK”. 24th Annual International Symposium on Audit Research, June 2018, Maastricht, the Netherlands. Farooque, O. A. and Buachoom,W. (2017). “Do Governance Mechanisms Influence Financial Performance? Empirical Evidence from an Asian Emerging Market”. 8th Financial Markets and Corporate Governance Conference, April 2017, Wellington, New Zealand; 3rd International Conference on Emerging Trends in Multidisciplinary Research, August 2017, Bangkok, Thailand. Mollah, S., Farooque, O. A., Mobarak, A. and Molyneux, P. (2017). “Bank Corporate Governance and Future Earnings Predictability”. The British Accounting and Finance Association Annual Conference, April 2017, Edinburgh, UK. Mollah, S., Farooque, O. A., Mobarak, A. and Molyneux, P. (2016). “Bank Corporate Governance and Future Earnings Predictability”. Portsmouth-Fordham Conference on Banking & Finance, September 2016, University of Portsmouth, UK. Fonseka, M. M., Farooque, O. A. and Tian, Gao-Liang (2016). “Political and interlock connection in the boardroom on private equity placements”. Accounting and Finance Association of Australia and New Zealand (AFAANZ) Conference, July 2016, Gold Coast, Australia. Farooque, O. A. and Buachoom, W. (2016). “Executive Compensation, Firm Performance and Corporate Governance: Evidence from the Thai Stock Market”. Accounting and Finance Association of Australia and New Zealand (AFAANZ) Conference, July 2016, Gold Coast, Australia. Farooque, O. A. (2016). “Sustainable Financial Reporting Practice in Australian Companies - Does Quality Matter”? Australia-Middle East Conference on Business and Social Sciences, April 2016, Dubai, UAE. Katmon, N. and Farooque, O. A. (2016). “Board Independence and Disclosure Quality of Investor Relation Magazine Award Winning Public Firms in the UK: Matched-Pair Sample Analysis”. 7th Conference on Financial Markets and Corporate Governance, March-April 2016, Melbourne, Australia. Chowdhury, A., Mollah, S. and Farooque, O. A. (2015). “Insider Trading, Information Asymmetry and Earnings Management”. American Accounting Association Conference (AAA), August 2015, Chicago, USA. Farooque, O. A. (2015). “Earnings Predictability, Ownership and Governance Structure: Emerging Trends in Australia”. Accounting and Finance Association of Australia and New Zealand (AFAANZ) Conference, July 2015, Hobart, Australia. Sun, L. and Farooque, O. A. (2015). “An Exploratory Analysis of Earnings Management before and after the Governance and Disclosure Regulatory Changes in Australia and New Zealand”. 7th International IFABS Conference, June 2015, Hangzhou, China. Mollah, S., Farooque, O. A. and Mobarek, A. (2015). “Corporate Governance and Earnings Predictability in Banks”. The 13th INFINITI Conference on International Finance, June 2015, Ljubljana, Slovenia. Farooque, O. A. and Ahulu, H. (2015). “Environmental Reporting in the UK, Australia and South African Multinational Companies”. Australasian Conference on Business and Social Sciences, April, 2015, Sydney, Australia. Basiruddin, R., Katmun, N. and Farooque, O. A. (2015). “Auditor Industry Specialization and Earnings Management: The Incremental Effects of Audit Committee Independence”. Journal of Contemporary Accounting and Economics (JCAE) Symposium, January 2015, Kuala Lumpur, Malaysia. Terdpaopong. K., Farooque, O. A., Wnuk-Pel. T. and Petchchedchoo, P. (2015). “A Review of ABC implementations in Chinese Industries”. Journal of Contemporary Accounting and Economics (JCAE) Symposium, January 2015, Kuala Lumpur, Malaysia. Buachoom W., Farooque, O. A. and Haong, N. (2014). “Board Characteristics and Financial Performance Relationship in Thai Listed Firms”. Haskell & White Corporate Reporting & Governance Conference, September, 2014, California State University, Fullerton, USA. Mollah, S., Hassan, M. K. and Farooque, O. A. (2014). “Corporate Governance, Risk-taking and Firm Performance of Islamic Banks during Global Financial Crisis”. Finance and Development in Islamic Economies Conference, September, 2014, Bangor University, Lancaster, UK; Financial Management Association (FMA) International Annual Conference, October, 2014, Tennessee, USA. Suyono, E., Farooque, O. A. and Wardani, S. K. (2014). “On the Relation between Governance Mechanisms, Income Smoothing and CSR Disclosure in the Indonesian Stock Exchange”. Australian Academy of Business and Social Sciences (AABSS) Conference, August 2014, Kuala Lumpur, Malaysia. Hamid, A. M., Farooque, O. A. and Yarram, S. R. (2014). "Corporate Governance Mechanisms and Firm Performance: Evidence from Jordanian and Australian Listed Firms". 13th Eurasia Business and Economic Society (EBES) Conference, June, Istanbul, Turkey. Katmon, N. and Farooque, O. A. (2014). "Co-Determination between Disclosure Quality, Earnings Management and Board Independence". British Accounting and Finance Association Annual Conference, London, UK. Farooque, O. A., Ahulu, H. and Yarram, S. R. "Environmental Disclosure in Multinational Companies: An Empirical Study on Developed and Emerging Markets". Asian-Pacific Conference on International Accounting Issues, November 2013, Bali, Indonesia; Sustainability Conference, November 2013, Auckland, New Zealand. Farooque, O. A. and Katmon, N. Disclosure Quality and Board Independence: A Bi-directional Relationship" .6th International Economic and Business Management Conference, October, 2013, Kuantan, Malaysia. "An Exploratory Analysis of Earnings Management before and after the Governance and Disclosure Regulatory Changes in Australia and New Zealand". Jointly with Lan Sun. Accounting and Finance Association of Australia and New Zealand (AFAANZ) Conference, July 2013, Perth, Australia. "Intergenerational Succession of Thai Small and Medium-sized Family-owned Businesses", Jointly with Kanitsorn Terdpaopong. 26th Annual Small Enterprise Association of Australia and New Zealand (SEAANZ) Conference, July 2013, Sydney, Australia. "Earnings Management and Board Characteristics in Thai Listed Companies". Jointly with Supawadee Sukeecheep and Subba Reddy Yarram. IBEA International Conference on Business, Economics and Accounting, March 2013, Bangkok, Thailand. "Making Succession a Success – Preliminary results from Thai SMEs". Jointly with Kanitsorn Terdpaopong, 14th West Lake International Conference on Small & Medium Business, October 2012, Hangzhou, Zhejiang, China. "Stakeholders Inclusiveness and Corporate Legitimacy: A Comparative Study of Social and Economic Reporting of Multinational Companies in Australia, South Africa and United Kingdom". Jointly with Helena Ahulu and Subba Reddy Yarram. 9th International Conference on Global Academy of Business and Economic Research, October 2012, New York, USA. "Disclosure Quality, Corporate Governance and Earnings Management". Jointly with Nooraisah Katmon. 3rd Global Accounting and Organisational Change Conference, July 2012, Sunway, Malaysia. "Ownership, Governance and Agency Costs in New Zealand Listed Companies". British Accounting and Finance Association Annual Conference, April 2012, Brighton, United Kingdom. "Shaping Corporate Governance System: An Analysis of the impact of Law and Culture in Selected Studies". International Symposium on Finance and Accounting at the International Conference on Business and Information, July 2011, Bangkok, Thailand. "Corporate Governance and Accounting Practice: Culture vs. Law Dominance of Literature". British Accounting and Finance Association Annual Conference, April 2011, Birmingham, United Kingdom. "Are Social Issues Relegated to the Backburner? An analysis of CSR Reports of Australian MNEs". Jointly with Helena Ahulu and Bernice Kotey. 22nd Asian-Pacific Conference on International Accounting Issues, November 2010, Gold Coast, Australia. "Ownership Structure, Board Characteristics and Financial Performance: Evidence from the Botswana Stock Market". Jointly with Sabur Mollah and Wares Karim. American Accounting Association (AAA) Annual Meeting and Conference, July-August, 2010, San Francisco, California, USA. "Macro-level Corporate Governance and FDI: Cross-sectional International Evidence". Jointly with Subba Reddy Yarram. American Accounting Association (AAA) Annual Meeting and Conference, July-August, 2010, San Francisco, California, USA. "The Economics of Asset Securitization: Lessons for Commercial Banks in Emerging Economies". 12th Malaysian Finance Association Conference, June 2010, Selangor, Malaysia. "Advances in Environmental Reporting among Australian MNEs using GRI Guidelines". Jointly with Helena Ahulu and Bernice Kotey. 2nd International Symposium on Corporate Governance (in Privately Owned Firms, Public Firms and Other Enterprises), February 2010, Sydney, Australia. "Causal Relation between Corporate Governance and Foreign Direct Investment: Cross-sectional International Evidence". Jointly with Subba Reddy Yarram. 5th International Conference on Global Academy of Business and Economic Research, December 2009, Kuala Lumpur, Malaysia. "Additional Evidence on Foreign Direct Investment, International Accounting Standards and Governance Interactions". Jointly with Subba Reddy Yarram. 21st Asian Pacific Conference on International Accounting Issues, November 2009, Las Vegas, USA. "International Evidence on Governance and Foreign Direct Investment Interactions". Jointly with Subba Reddy Yarram and Sarod Khandaker. Singapore Economic Review Conference, August 2009, Singapore. "Does the IFRS Adoption in Selected Countries Coincide with a Harmonization of Accounting for Deferred Tax and Goodwill"? Jointly with Leopold Bayerlein. Accounting and Finance Association of Australia and New Zealand (AFAANZ) Conference, July 2009, Sydney, Australia. "Financial Reporting Harmonization on Selected Items: Evidence from Australia, Hong Kong and the United Kingdom". Jointly with Leopold Bayerlein. 32nd European Accounting Association Congress, May 2009, Tampere, Finland. "Unidirectional Non-monotonic Relationship between Managerial Ownership and Firm Performance: The Case of family Firms in Bangladesh". 1st International Symposium on Corporate Governance in Privately Owned Firms, April 2009, Sydney, Australia. "Additional Evidence on Foreign Direct Investment, International Accounting Standards and Governance Interactions". Jointly with Subba Reddy Yarram. 1st International Symposium on Corporate Governance in Privately Owned Firms, April 2009, Sydney, Australia. "Leadership Role and Entrepreneurial ability of Number One Shareholder in Improving Corporate Performance under the Governance Structure of an Emerging Market Economy". 9th International Business Research Conference, November 2008, Melbourne, Australia. "Factors Influencing Corporate Ownership Structure in an Emerging Market: Some Issues on Entrepreneurship". International Conference on Business and Information, July 2008, Seoul, Korea. "Co-deterministic Relationship between Concentration of Ownership and Corporate Value: Evidence from an Emerging Market". Jointly with Tony van Zijl, Keitha Dunstan and AKM Waresul Karim. Accounting and Finance Association of Australia and New Zealand (AFAANZ) Conference, July 2008, Sydney, Australia. "Co-deterministic Relationship between Concentration of Ownership and Corporate Value: Evidence from an Emerging Market". Jointly with Tony van Zijl, Keitha Dunstan and AKM Waresul Karim. 31st European Accounting Association Congress, April 2008, Rotterdam, The Netherlands. "Determinants of Ownership Structure in an Emerging Market Economy". 7th International Business Research Conference, December 2007, Sydney, Australia. "Ownership Concentration and Firm Performance Interactions in an Emerging Market Economy". Jointly with Tony van Zijl, Keitha Dunstan and AKM Waresul Karim. 19th Asian Pacific Conference on International Accounting Issues, November 2007. Kuala Lumpur, Malaysia. "The Effect of Ownership Concentration on Firm Value and Corporate Governance in Bangladesh Listed Firms". Jointly with Tony van Zijl, Keitha Dunstan and AKM Waresul Karim, Accounting and Finance Association of Australia and New Zealand (AFAANZ) Conference, July 2007, Gold Coast, Australia. "A Mono-directional Perspective of Board Ownership and Performance Relation in Bangladesh" Jointly with Tony van Zijl, Keitha Dunstan and AKM Waresul Karim. 18th Asian Pacific Conference on International Accounting Issues, October 2006, Maui, Hawaii, USA. "Non-monotonic Relationship between Ownership Concentration and Performance in Bangladesh under Mono-directional Perspective". Jointly with, Tony van Zijl, Keitha Dunstan and AKM Waresul Karim. Accounting and Finance Association of Australia and New Zealand (AFAANZ) Conference, July 2006, Wellington, New Zealand. "A Mono-directional Perspective of Board Ownership and Performance Relation in Bangladesh". Jointly with Tony van Zijl, Keitha Dunstan and AKM Waresul Karim. 29th European Accounting Association Congress, March 2006, Dublin, Republic of Ireland. "Bi-directional Relationship between Ownership Concentration and Performance in Bangladesh under Simultaneous Equations Approach". Jointly with Tony van Zijl, Keitha Dunstan and AKM Waresul Karim. 17th Asian-Pacific Conference on International Accounting Issues, November 2005, Wellington, New Zealand. "Corporate governance in Bangladesh: Evidence on the link between Board Ownership and Financial Performance". Business and Government in Bangladesh in the 21st Century Conference, November 2005, Melbourne, Australia. "A Simultaneous Equations Approach to Analysing the Relation between Ownership Structure and Performance in Bangladesh", Jointly with Tony van Zijl and Keitha Dunstan AKM Waresul Karim. The Inaugural Asia-Pacific Corporate Governance Conference, August 2005, Hong Kong. "A Simultaneous Equations Approach to Analysing the Relation between Ownership Structure and Performance in Bangladesh", Jointly with Tony van Zijl and Keitha Dunstan AKM Waresul Karim. Accounting and Finance Association of Australia and New Zealand (AFAANZ) Conference, July 2005, Melbourne, Australia. A/Prof Farooque has consultancy experience with World Bank in Bangladesh, TAFE NSW and Pearson VUE Australia in the areas of financing in higher education, curriculum development and financial accounting and reporting. World Bank consultancy work on “Financing Issues of National University Affiliated College Education in Bangladesh” from 15 February to 30 June 2011. TAFE NSW, Australia, consultancy work on “Curriculum and Educational Resource Development Services for an Associate Degree in Accounting” in May 2011. Pearson VUE, Australia, consultancy work as a ‘Subject Matter Expert’ of Financial Accounting and Reporting for professional level Year Program of CPA Australia from 24 February to 31 December 2010.